We had many excellent performances over the weekend from our Club Nationals crew. 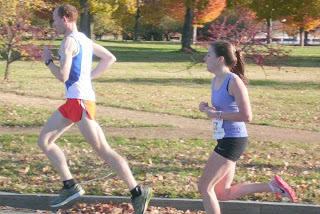 Rather than focus on the athletes who were tuning up for big performances in Seattle, I want to comment on two runners who will not be running Clubs and from whom I expect big things in 2012, Jake and Elizabeth. 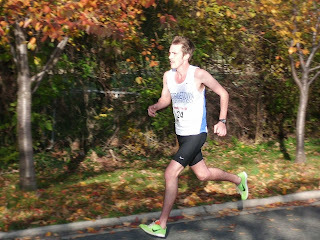 Jake has been trying to recover from a serious injury for more than a year, and after months of taking two steps forward and one step back, he is on the verge of being healthy enough to resume full training with an eye towards being race fit in the spring. During his lengthy recovery, Jake has shown incredible determination to return to action, and has continued to perform his time-consuming, often thankless role as GRC captain. 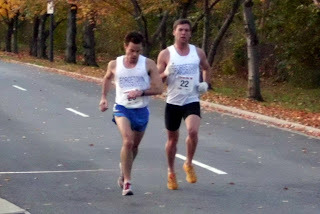 If there is justice in the running world, Jake’s dedication to the sport and the team will pay off in 2012, and his successful return to racing without having done any track workouts in 6 months portends more excellent results from him in the future. In contrast to grizzled GRC veteran Jake, Elizabeth made her GRC debut on Thursday after a successful collegiate career at Johns Hopkins. Elizabeth has a world of potential and she’s ready to work extremely hard to make the transition to road racing after focusing on the 1500 and steeple in college. I’m excited to see what she can do with a few months of training under her belt. 1) We will practice on Saturday morning at the cell tower field, likely at 9:00 a.m. If you’re running Clubs, you want to be there if at all possible (but everyone is welcome). And if you’re running Clubs, you do not want to do a long run on Sunday. I want everyone rested and ready to roll in Seattle, so we’ll get in some work on the grass on Saturday, and after that we’ll be in taper mode. 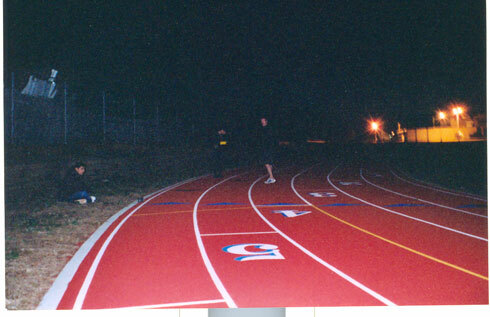 2) The workout next week, which will be short and sweet, will be on TUESDAY night at BCC to accommodate our race/travel schedule. 3) Don’t forget the team meeting on December 17 at 5 pm in a bar-to- be-named-later in Bethesda. If you’re getting this email, I’d like you to be there if at all possible, as we will be discussing some pressing training/racing and administrative matters that are of concern to all of you. The workout on Wednesday will be our last hard session prior to Clubs and we’re going to get after it. The men will do 4 x mile with a 3 minute recovery. The A group will go 5:00, 4:50, 4:40, 4:30; the B group will go 5:15, 5:05, 4:55, 4:45. The women will go 3 x mile with a 3 minute recovery in 5:40, 5:30, 5:20. PMurph and I plan on running from the line tomorrow at 9AM. I'm guessing between 10-13mi. Comment if you plan on showing up. Or... just show up. 9AM. 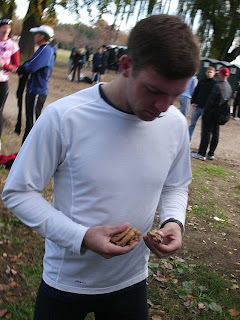 Samuel Luff first overall, in 31:32. Runs last 4 miles or so alone against the brutal hills and wind. 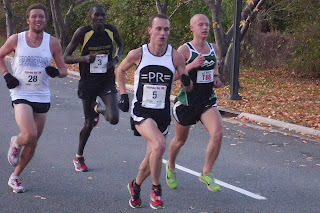 Jake Klim marks return to racing with a convincing win in 15:57 in a 5k in Sandwich, Mass. Reports a 4:57 first mile. 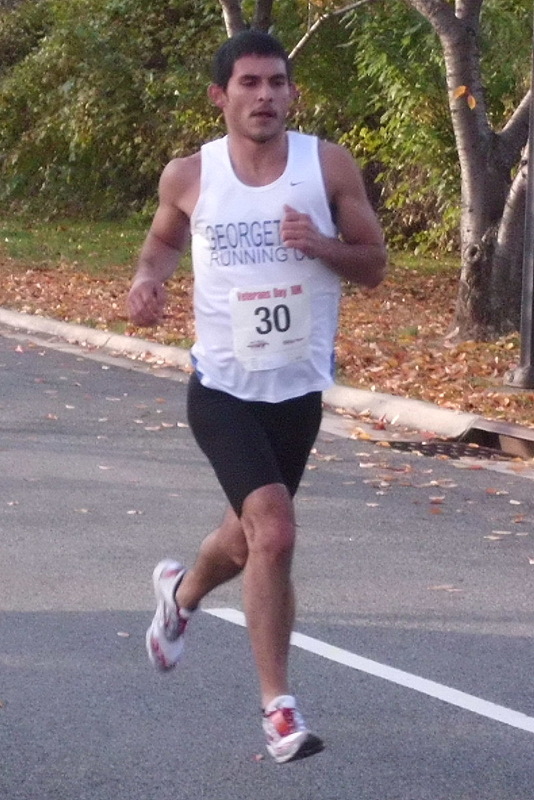 Patrick Murphy runs yet another 8km of 5:20/mi, finishing in 26:45 and 2nd overall at the Pete Keyes Turkey Trot in Binghamton, NY. We can all hope to strive for such consistency in the 8k. Also ran 2xmile @ that pace before the race start. Maura Carroll wins Pittsburgh YMCA 5k. 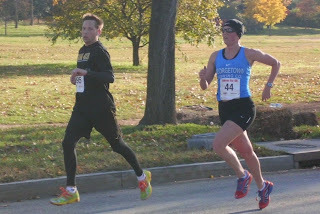 Lisa Chilcote is top master in the "5.27 miler", running even 6:14 splits. Charlie Ban wins the Gutbuster 8mi trail race in 49:16, setting the course record. "Demolished second place guy in the last mile"
Ryan Witters runs 14:53 en route to a 2nd place finish at Turkey Day 5k in Evansville. Now he heads home to spend time with the best family in the world. Dave Wertz places 2nd overall in the Boston Volvo 5k (in Boston), finishing in 16:00. Susan Hendrick comes in 3rd at the St. Petersburg Times Turkey Trot 5k and is probably the only team member who was ever warm on race morning. 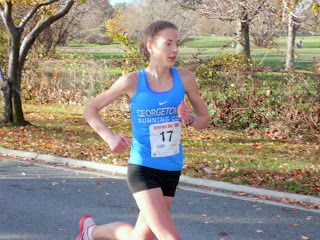 Newcomer Liz Laseter puts in a fine performance at the Charlotte Turkey Trot 8k, coming in 6th with a time of 31:13, possibly a PR! Congratulations to Kate, Drea, and Michelle for their performances in Philadelphia. 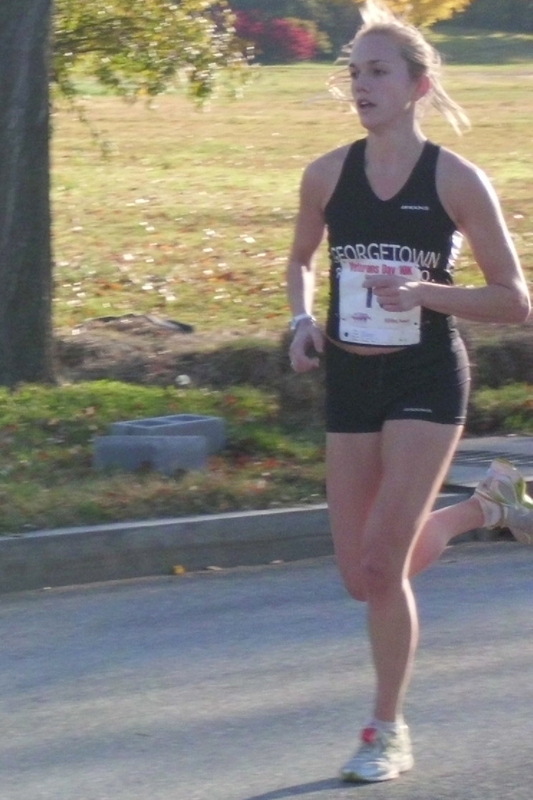 Kate ran a huge PR of 2:53:20, cutting over six minute off her previous best. Kate has had a spectacular 2011, running significant PRs at every distance. In the last two years Kate has transformed herself from an average local runner to elite status. Kate is only starting to scratch the surface of her talent, and there is every reason to believe that Kate will continue to make dramatic breakthroughs in the future as she develops the confidence to believe that she can compete at the highest level. I could not be more pleased with Kate’s performance yesterday, and I’m excited to watch her continued progression! Drea also ran a huge PR of 1:21:06, knocking over 80 seconds from her previous best. Drea ran aggressively early on, setting a new 10k PR en route, and not surprisingly, she paid the price later in the race, but fought to the tape and held on for an excellent result. Drea was quite disappointed that she was not able to run Chicago due to a nagging injury, but this performance was certainly a nice consolation prize. With a full season of injury-free training in the spring, Drea will continue to develop into a runner to be reckoned with! While Michelle did not meet her goal of qualifying for the Trials, she proved to me this season that she has a great future in the marathon. Her training was superb, and had she been fully healthy on race day (which she was not), there’s no doubt in my mind that she would have qualified with time to spare. Not to belabor the point, but Michelle is a national-class marathoner waiting to happen, and despite (or perhaps because of) this setback, she will be back with a vengeance when the qualifying window opens for 2016. Well done to all! 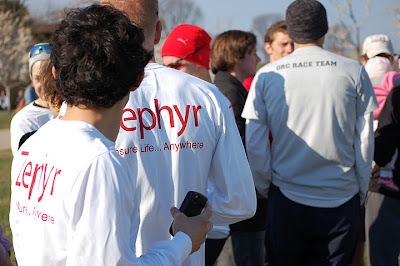 And good luck to everyone who is racing on Thursday. I expect more great results to report next week. 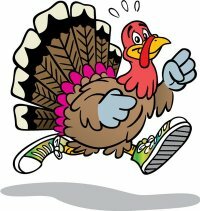 We'll be on the track this week on MONDAY because of thanksgiving races. We'll try to roll at 7:15 as normal. Everyone is doing a 4-3-2-1, with a 3 minute recovery on all of it. The A group will go 72s, 70s, 68s, 64. The B group will go 74s, 72s, 70s, 66. The women will go 84s, 81s, 78s, 74. Looking ahead, we will not meet again until the Wednesday after Thanksgiving, Nov 30, at which point we'll be 10 days out from Clubs, and we'll work hard at that workout. We'll come back the following Saturday, 12-3, at the cell tower field, and we'll have one final light sharpening workout either Tuesday or Wednesday the week of clubs. We're looking great, and we'll be ready to go in Seattle. 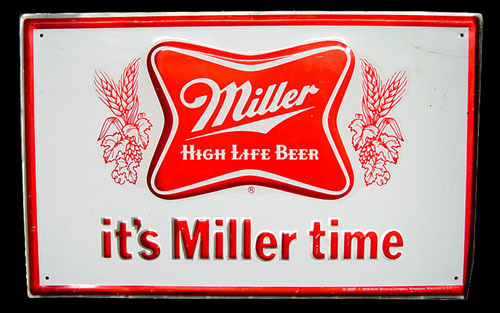 And please mark your calender for the team meeting on Saturday, 12-17, at 5 pm in Bethesda at a bar to be named later. Kate Dart -- 2:53:19, 6-minute PR! 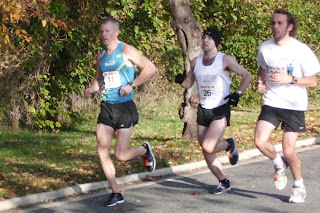 Michelle -- 2:59:41, notes "That was the hardest thing I've ever done"
FLASH: Patrick Murphy runs 26:39 at Rothman 8k in Philadelphia this morning. Sunday promises to be a red-letter day for the GRC women. Michelle Miller and Kate Dart are running the marathon while Drea Garvue is running the half. Michelle is planning to make a major splash in her marathon debut, and is shooting for the Olympic Trials B standard of 2:46. "Michelle's preparation could not have gone better", said Coach Jerry, "she has hit every single workout at or below the target times, and has stayed well within herself even while running some very hard workouts. Her tune up races went great, and I have every reason to believe that she will qualify. I take nothing for granted, but I am extremely optimistic that she will get the job done, with some time to spare." Alexander continued "Kate is also in amazing shape. Throughout this training cycle, I've had to keep reminding myself that Kate's PR is a relatively modest 2:59, because the way she's been training, she has sub-2:50 written all over her. Kate is ready for a major, major breakthrough on Sunday. "Drea is ready to take a huge chunk off her current PR of 1:22:30. She's been with Michelle and Kate every step of the way in training, and after running some very impressive sharpening workouts in the last 2 weeks, I expect Drea to take a real shot at sub 1:20." Charlie Ban looks to continue his solid fall season while running the half marathon and Scott Koonce will be running the full 26.2 for the GRC. From Coach Jerry: "let's shoot for starting the workout at 9, which means meeting for the warm up at 8:15. We'll run intervals, and the way I'd like to do it is to use a designated loop that will be somewhere in the 1k range. I've tried to explain in writing how we can do this once today already, and despite the utter simplicity of the plan, the written version is almost incomprehensible, so I will spare you my ramblings. Suffice to say that the men will do 8 x loop, and the women will do 6 x loop. As always, we will run a progression, so the men will do 2 x loop @ x time, 2 @ loop at x minus 5 seconds, 2 x loop @ x minus 10 seconds, 2 x loop @ x minus 15 seconds, all with a 2:30 rest. The women will 2 x loop @ x, 2 x loop @ x minus 5 seconds, 2 x loop @ x minus 10 seconds, also with a 2:30 rest. As mysterious as this may sound, all will become clear on Saturday." OPTION B: GEORGETOWN STORE @ 9:00AM? TBD. Anyone want to run long at Old Angler's Inn? 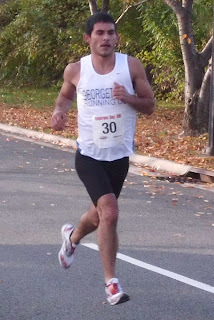 Andy Sovonick (18th, 33:45) passed the first mile in the first Veterans Day 10k that wasn't a disaster for him. Sam Luff (3rd, 31:00) and Ryan Witters (4th, 31;17) came through three miles just under 15 minutes. Ryan Hanson (6th, 31:55) and Wilson Komen (7th, 32:12) stalk GRC defector Chris Sloane at three miles. Paul Guevara (15th, 33:00) got back on the roads after cooling his heels in Texas and Alabama following last month's Twin Cities Marathon. Anna "Usain" Holt-Gosselin led the GRC women in 3rd place in 35:39. Jerry Greenlaw (14th, 32:58) loops around in the fourth mile. Dickson Mercer (10th, 32:19) and Dave Wertz (11th, 32:38) planned to run together and that ended up being a good idea. Maura Carroll continued an excellent fall racing season with a 6th place finish in 37:05. Susan Hendrick ran 37:34 for 9th place,then forgot to put her ticket in the raffle basket to try to win a free vacation. Laura O'Hara's shoe came untied shortly before the third mile marker and she spent at least 30 seconds retying it, but still finished 10th in 37:42, holding off a Pacers runner. 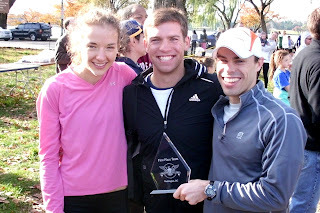 The trophy for the Veterans Day10k team competition will rest in the GRC case at Hank Dietle's. Ryan's eating cookies in this photograph. 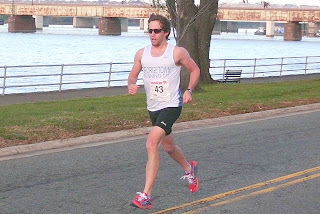 FLASH: Ban runs 25:18 for 8k in Richmond. 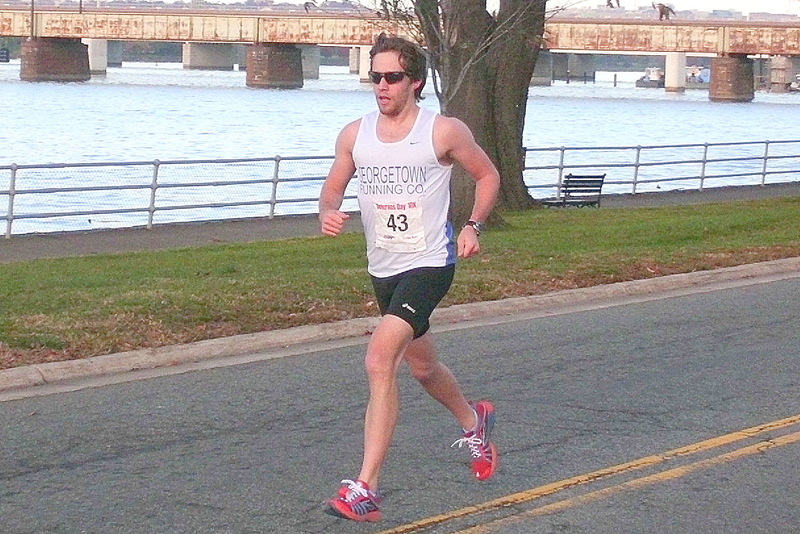 In what is arguably his best race ever in a GRC singlet, Charlie Ban ran a 57-second PR 25:18 this morning in Richmond at the HCA VA 8k. On Sunday GRC is sending a huge contingent to race local competition at the Veteran's Day 10k. A full preivew of that race to come later today. 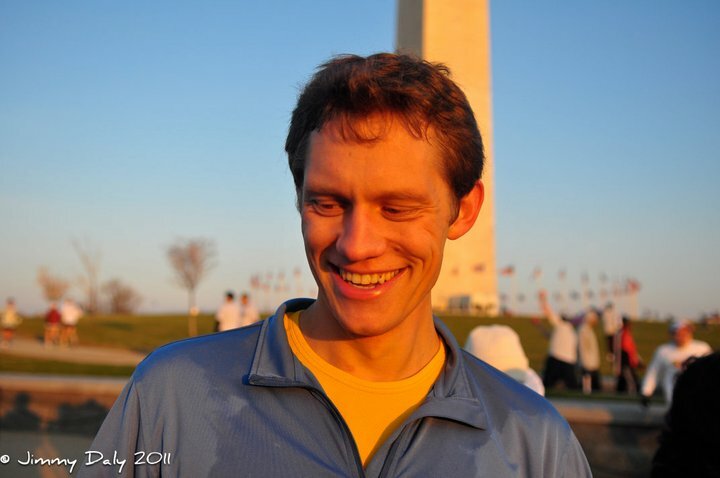 For anyone interested, I am hosting an easy run from the Chevy Chase store at 9am this Saturday with free food across the street at Whole Foods afterward. They are planning a yogurt parfait bar, a local tea producer, and a chef with some demos. I know a good handful of you are running Vet's Day so might be a nice alternative to the usual GRC location. Comment if you're interested. 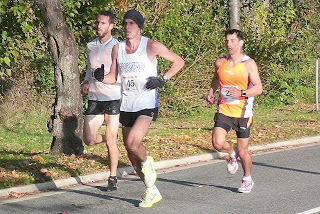 Come Run the Kinhaven 5K on November 20, 2011. Come out and run a local grassroot community driven event for a local Arlington, VA Pre-school. Tech Shirts, The North Face Race Bags & Waterbottles, PowerBars, Awards for Overall and Age Group, Barefoot Running Awards and a raffle for a BOB Stroller. A pre and post race food and snacks being donated by local businesses such as Giant Foods, Whole Foods, Safeway. It is going to be fun and look forward to seeing you out there. Congratulations to Chris Bain for a very nice run in New York. We'll have many more athletes in action this weekend at Veterans Day 10k, and I'm expecting some excellent performances in our last big tune up before Clubs. If you want to run Vets Day, you must register in advance, so don't delay. Jake needs to submit our list for Cherry Blossom in the near future, so if you want to get in on the guaranteed entry gravy train, be sure to send Jake your 10 mile PR, 2011 CB place and time, and expected 2012 time, and cc Jerry. For the workout this week, we'll be at BCC (next week, 11/16, we'll be on the mall). The men will do 1 x 2k, 2 x 1k, 4 x 500, with 3 minutes after the 2k, and 2:30 after the 1ks and 500s. The A group will go 75s on the 2k, 72s and 70s on the 1ks, and the 5s will be 2 @ 66, 2 @ 64. The B group will go 77s on the 2k, 74s and 72s on the 1k, and the 500s will be 2 @ 67, 2 @ 65. Evidently Pat Hughes and Billy Askey are, too. I'd have know that if they had put their names on the racing calendar. UPDATE: Bain crosses line in 2:34:43! !